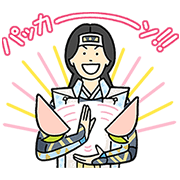 http://www.line-stickers.com/ – The Three Heroes and Princess Kaguya Line Sticker | The new commercials from au are blowing up TV sets everywhere with their hilarious hijinks! Peach Boyʹs girlfriend Princess Kaguya is coming over and these boys are smitten like ogres from Onigashima. Illustrator Yutanpo Shirane brings these ancient heroes to life with these classy designs. Available till May 28, 2015. Unsleep Sheep ANTM #Cycle21 Stickers! The Burrebrero JUST DO IT. Previous post What kind of Hello are you today?